E. I. DU PONT, BOTANISTE. THE BEGINNING OF A TRADITION. University Press of Virginia, (1972). First Edition. hard cover. Fine/Very Good. Charlottesville: The University of Virginia Press. 1972. 140 pp. Illustrated. Hardcover w/ dust jacket. Internally fine copy. Dust jacket lightly sun-faded at the spine and around the top edge. Also shows some minor wear. Book itself is lightly shelf worn but otherwise a very good copy. Interior is clean, bright and free of stray markings. EARLY AMERICAN MUSIC ENGRAVING AND PRINTING. Urbana:University of Illinois Press, 1980. hard cover. Very Good/Very Good. A History of Music Publishing in America from 1878 to 1825, with Commentary on Earlier and Later Practices. Urbana:University of Illinois Press. . 321pp. Illus.S006. EARLY CHINESE POTTERY AND PORCELAIN. 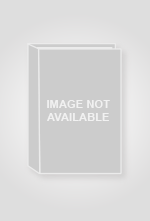 NY:Pitman Publishing Corporation. hard cover. Very Good/Good. NY:Pitman Publishing Corporation. 48pp. + 95 plates. With d.j.Jacket soiled and frayed at edges, otherwise a very good copy. S006. 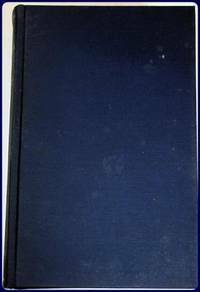 New York:The American Numismatic Society, 1983. hard cover. Very Good/No jacket. New York:The American Numismatic Society. 1983. 55pp+28plates. Hardcover. &nbsp;A very good clean copy, inside and out. THE EARLY HISTORY OF NARRAGANSETT. Providence: Marshall, Brown and Company, 1835. First Edition. hard cover. Very Good/No jacket. In Collections of the Rhode-Island Historical Society, Vol III.Providence: Marshall, Brown and Company.1835.315pp. Ex-lib.Except for some light foxing, a very good, tight, clean copy.S002. Cambridge:Cambridge University Press, 1927. hard cover. Very Good/No jacket. Cambridge:Cambridge University Press. 1927. 75pp. Hardcover. No dust jacket. Red boards are lightly rubbed and shelf-worn. Someone has written the authors name in pencil on the spine but barely visible. Internally, save for the paper being lightly age-toned, a very good, clean copy with no prior owners marks or signatures. 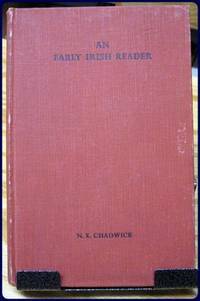 *From the Preface... "The Scel Mucci Mic Datho"&nbsp;or "The Story of Mac Datho's Pig" is justly regarded as one of the best of the Irish Saga's. 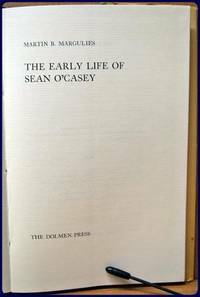 In spite of its brevity it is very varied in character, and several different types of prose and poetry are represented in it.&nbsp; It is well adapted therefore to serve as an introduction to the study of Early Irish Literature in the original, and for this purpose the present reader is primarily intended." hard cover. Fine/Good. 219pp.Illus. With dust jacket. A fine copy. Baltimore:Bodine &amp; Associates, Inc., 1982. 2nd Edition. hard cover. Very Good/No jacket. Baltimore:Bodine and Associates, Inc.&nbsp; 1982. 2nd edition, revised. 269pp. Illustrated. Hardcover.&nbsp; Previous owners name to 1st free fly-leaf, otherwise a very good, clean copy, inside and out. 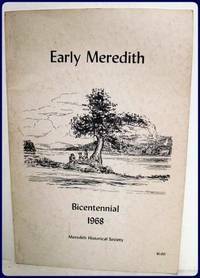 [Meredith, N. H.]: Meredith Historical Society., 1876. First Edition Thus. soft cover. Fine/No jacket. [Meredith, N. H.] Meredith Historical Society. 1976. 84pp. Illus. Soft cover. A fine copy. 2nd printing to which has been added an index of persons mentioned in the pamphlet. S078. EARLY NANTUCKET ARTISTS. In HISTORIC NANTUCKET, Vol. 6, #1, pp. 11-24. Nantucket Nantucket Historical Association., 1958. First Edition. soft cover. Very Good/No jacket. 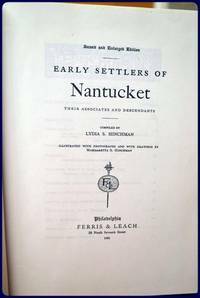 Nantucket: Nantucket Historical Association. 1958. 43pp. Illus. Soft cover.Also includes Michael Bachman'sSHIPWRECKS AROUND NANTUCKET SINCE 1940 and other articles. *Ex-library one-line hand-stamp at base of wrappers.Sticker removed top right edge. Y003. Orig. publ. as vol. 19, 2nd series of Penn. Archives, 1893. With a new intro. by George E. McCracken. Buckram. VG. EARLY SETTLERS OF NANTUCKET. Their Associates and Descendants. London:Her Majesty's Stationery Office, (1959). First Edition Thus. soft cover. Very Good/No jacket. London:Her Majesty's Stationery Office. (1959). pp. Illus. Wrps. A fine copy.S010. Henry G. Bohn , 1848. hard cover. Very Good. Arculf, Willibald, Bernard, Saewulf, Sigurd, Benjamin of Tudela, Sir John Man[undeville, De La Brocquiere; and Maundrell. London:Henry G. Bohn. 1848. 517pp. Ex-library copy. Small library book-plate on indside cover, several small library stamps throughout, and shelf location in white on spine. Shelf wear to cover. Spine and edge points rubbed to boards in places. Foxing on end pages and edges. Otherwise,&nbsp;a very good tight&nbsp;copy. 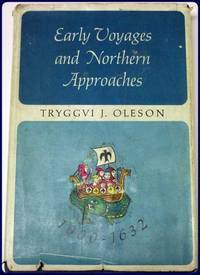 EARLY VOYAGES AND NORTHERN APPROACHES. Toronto: McClelland and Stewart Limited., 1963. hard cover. Very Good/Very Good. (Toronto): McClelland and Stewart Limited. (1963). Illustrated. xii+211p. Hardcover with dust jacket. Dust jacket is torn at edges and soiled. Blue boards lightly soiled but gilt on spine still bright. Some soiling to page edges. Internally, end pages lightly age-toned, but otherwise a very good, clean copy. University of Pittsburgh Press, 1938. hard cover. Very Good/Good. Pittsburgh: University of Pittsburgh Press. 1938. 300 pp. Illustrated. Hardcover w/ dust jacket. Ex-library copy. Dust jacket is chipped, and also torn along the top edge,now encased in brodart. ; it is otherwise in good condition. Inside flap is detached and pasted on first fly leaf. Aside from the library bookplate and card holder in back, a very good copy. New York:The Macmillan Company, 1914. First Edition. hard cover. Very Good/No jacket. New York:The Macmillan Company. 1914. 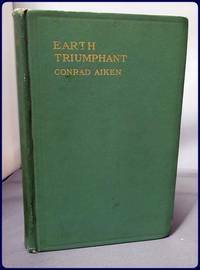 1st edition of author's 1st book. (xii)+219pp+4pp ads. 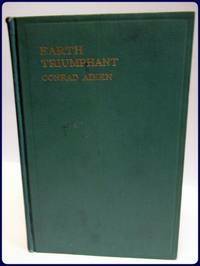 Hardcover.&nbsp; Green boards lightly soiled and rubbed, with spine ends worn and edge points gently bumped. Page edges soiled.&nbsp;Internally, previous owners name and date inked to 1st free end page, otherwise pages clean. The binding is tight and hinges intact. Overall, a very good copy of the authors first book. NY:G. P. Putnam's. 1932. 99pp. 1st. ed. A very few minor imperfections otherwise a very satisfactory copy. Book tile on the spine completely worn off.